Downtown Fit Camp in San Bernardino is dedicated to providing one-on-one coaching during our bootcamp classes. 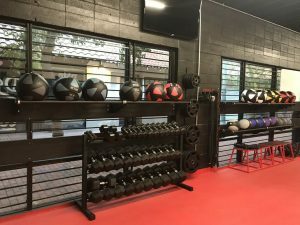 Unlike other gyms, you only pay for the fitness classes that you take, so you really do get what you pay for and aren’t charged for a gym membership when you are traveling, sick, injured, or simply unable to attend. Also, when you take our fitness classes, you can expect that our certified coaches and your classmates will know your name, push you to go harder, and will celebrate your victories with you. Check out our schedule below and join us for a free week of classes! • Children with obesity are at higher risk for having other chronic health conditions and diseases that impact physical health, such as asthma, sleep apnea, bone and joint problems, type 2 diabetes, and risk factors for heart disease. • Children with obesity are bullied and teased more than their normal-weight peers, and are more likely to suffer from social isolation, depression, and lower self-esteem. • In the long term, childhood obesity also is associated with having obesity as an adult, which is linked to serious conditions and diseases such as heart disease, type 2 diabetes, metabolic syndrome, and several types of cancer. • Some data show that children with obesity miss more days of school compared to students with normal weights. Missed days of school, whether due to illness or to avoid weight-based bullying, can make it hard to keep up academically. DOWNTOWN FIT CAMP believes you don’t have to lose your heart in the search for new clients or money! I AM BETTER THAN I USED TO BE, BUT I AM NOWHERE AS GOOD AS I WILL SOMEDAY BE. The benefits of exercise are many. Regular physical activity can help people manage their weight, sleep better, reduce the risk of some diseases, including type 2 diabetes (T2D) and heart disease, and improve your overall quality of life—among other proven benefits. People with type 1 diabetes (T1D) can gain the same benefits from exercise as anyone else. Yet studies show that many people with T1D do not engage in regular physical activity owing to a fear of hypoglycemia, or dangerously low blood-glucose levels. Exercise scientists and athletes with T1D alike say that people with T1D can exercise safely and effectively. It’s a matter of observing how your body responds to exercise, learning to balance insulin, food, and physical activity, and using research-supported strategies to minimize the risk of hypoglycemia during and after exercise. Although physical activity (PA) is a key element in the prevention and management of type 2 diabetes, many with this chronic disease do not become or remain regularly active. High-quality studies establishing the importance of exercise and fitness in diabetes were lacking until recently, but it is now well-established that participation in regular PA improves blood glucose control and can prevent or delay type 2 diabetes, along with positively affecting lipids, blood pressure, cardiovascular events, mortality, and quality of life. Structured interventions combining PA and modest weight loss have been shown to lower type 2 diabetes risk by up to 58% in high-risk populations. Most benefits of PA on diabetes management are realized through acute and chronic improvements in insulin action, accomplished with both aerobic and resistance training. The benefits of physical training are discussed, along with recommendations for varying activities, PA-associated blood glucose management, diabetes prevention, gestational diabetes mellitus, and safe and effective practices for PA with diabetes-related complications.